"Since when did people shake hands?" Checking his location, Charles looks up to see the landmark of the viaduct. Shortly he will stop to rest close by the arches of the viaduct — when he first hears the sound of the approaching dog pack. Description: The railway viaduct arches are the most familar sight in photographs and images of Monsal Valley. The viaduct makes for an impressive sight from whatever vantage point is chosen on the valley floor. Where is it? 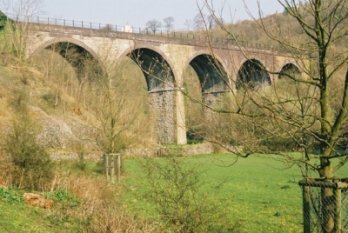 : The viaduct spans the valley, and once carried the Manchester to London train on its journey through the Derbyshire dales. This viewpoint of its arches can be reached from a number of directions. It is possible to descend down a very steep and uneven path from the viaduct top to the valley floor. It is also possible to reach the area by following the footpath the leads off the single roadway into the valley from Monsal Head, (passing by the barn in which Charles meets the young girl, and crossing a footbridge) to pass underneath the arches, before turning to look back. Where's the best vantage point? : The shot is taken close to the stone gateway easily identifiable in the screen shot. It is possible to view the viaduct, at a distance, from the roadway itself. What about access? : The viaduct is open to the public and there are no photographic restrictions. Climbing down from the viaduct top to the valley floor can be treacherous and hard going in when the weather is poor. Travelling along the valley floor footpath provides an easier access route. Anything else? 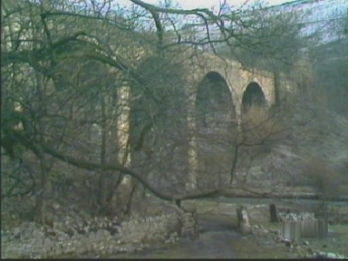 : The first dog attack, and the first meeting between Charles and Fenton, take place in the space between the stone gateway and the viaduct arches. Wires have since been strung underneath each of the arches to discourage absailers and bungee jumpers.